There's a famous roast chicken recipe you may have heard of called "chicken with 40 cloves of garlic." While the amount of garlic in that recipe seems impressive, the fact that the garlic cloves are left whole results in a sweet and fairly mild garlic experience. This chicken with 20 cloves of garlic isn't quite so subtle, and features the "stinking rose" in a pungent one-two punch. The fistful of garlic is first pureed and used as a marinade, then used as a sticky glaze as the chicken roasts. The result is chicken as a very effective garlic delivery system. As you'll hear in the video, I recommend throwing a handful of chopped Italian parsley on top when you serve this delicious chicken. 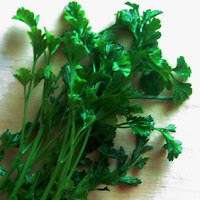 Fresh parsley really does freshen the breath when large amounts of garlic are consumed. In fact, this is the origins of the ubiquitous sprig of parsley that sits uneaten on so many plates. By the way, that reminds me of one of the first dirty kitchen jokes I ever heard, and still one of my favorites. Since I get a fair share of minors on the blog, you'll fill in the blanks yourself, but it really shouldn't be too hard. "What's the difference between parsley and ________? Nobody eats parsley." Enjoy! Hee. Dirty jokes are awesome. Thanks for sharing the recipe, Chef! More efficient garlic delivery is a goal I strive towards. One day, I'm hoping to set up an IV drip. cooking is easy, following a recipe is hard. My first kitchen joke...What the differnce between a cheeseburger and a ----job.When they say they don't know...say Want to go to lunch!!!!! !YOU are funnnnnnnnny. If I don't have olive oil can I use vegetable oil instead? Sure, but not as good. Get some olive oil- it's a must have for every kitchen. lol what if somebody eats both? I love garlic so much! Of course, I always have a pack of gum on hand for dishes like these. CJ - Do you think this will work on the grill? Thanks! yes, I love Dijon in anything. Wow, your knife is really really SHARP. I love how it just glides through the chicken, wooooooo. can i marinate it for few hours say 5 hours? or it must be marinated overnight? Dijon mustard: a great secret marinade ingredient (enhancing the roasted meat flavors) but overwhelms easily; a little pinch serves better than a whole spoon. this will probably burn on the grill. cilantro should work similarly. but, dont fear the fish sauce. Did you put that in the middle of the oven? I thought baking was done on the bottom of the oven. I don't know, I'm just asking. Does it make a difference? i always cook in the middle of the oven as I believe that is where the most even heat distribution occurs, but I could be wrong. OMG I have to make this. Bookmarked! Hey John would you recommend a food processor/blender for me? we have a cuisinart blender which is fine, but i dont know about others. i'd check some online reviews. This is an amazing dish Chef. I made this for my wife tonight (she is a garlic lover). I really love your blog, keep up the good work. Oh, btw, I had garlic mashies and ginger carrots as sides. YUMMY! I made this on Friday night for dinner. It was wonderful. Served it with some toasted Israeli couscous. Everyone loved it. Thanks! I'm down here in Zimbabwe. Wasted a lot of time playing games. Now I have a new addiction. Good thing is: I have fun and learn at the same time. My family is really impressed with my cooking these days. Chef u are a superstar! Am buying six chickens then cut and pack according to parts. This recipe will be for drumsticks. If picky eaters in my house wont eat? Will have a one woman party!Oh boy I am so excited!!! Chef John, can you help me with the oven setting you used for this recipe. Which of the following setting should I use? fan assisted mode, convection mode, grill or fan assisted grill. Thanks. sorry, i just have a regular oven. i'm not sure what those setting are. its not a very fragile recipe, just bake it and check a little early. How many dirty kitchen jokes can there be? Hi chef! my fiance and i jus made and ate this chicken with mashed potatoes and your mushroom gravy. WOOOOW!!!! truly amazing and pleasurable! even my wife who doesnt like garlics loved this. thanks again for all your efforts. it is really appreciated. love your blog and your recipes, especially my wife who loves cooking and baking. once again, WOOOW!!! and thank you. Would it have a BIG difference if i use chicken fillets? I was wondering--would it make a huge difference to use rice vinegar instead of red wine vinegar? Should I use more, less? Or just splurge for the red :)? what chef's knife do you use? I made this twice in the same week. The house reeked of garlic while this was baking, and my husband came home from work and told me that he could smell this from outside the house. We basked in the glorious stink. This is some mighty fabulous chicken. Thank you so much for sharing! I love garlic and i really want to try this...although i wanted to ask you few things about it. 1. Does 1 whole chicken equivalent to 1kg? 2. Can i use Chicken Breast Fillet for this recipe? if so...How much chicken can i use with this recipe? 3. Is it ok if i half this recipe, would it still taste good and the same as the original? 4. I dont have red pepper flakes...will 1/2 tsp of hot sauce do as a replacement? cooking is not an exact science, so i can't specifically answer most of the questions. A whole chicken here is about 4-5 pounds. You can use breasts or halves but it will not be the same dish. I can't give salt measurements since everyone tastes salt differently. You don't need to eye it, just sprinkle it on. Taste and adjust. this is not a precise recipe! ;-) enjoy! After making the chicken, decided to use this recipe on turkey breast on Thanksgiving and it was the best turkey ever! I made this last night for the family. I prepped it in the morning and let it marinate for about six hours instead of overnight, but it was still magnificent. Even with my crappy knives, I was able to make it work. I'm definitely working this recipe into the regular rotation. I've been on a garlic binge lately. I have made garlic soup, garlic fries, garlic bread... and your garlic chicken recipe was next in line. I just made this today. Subbed the red wine vinegar with apple cider vinegar, upped the garlic by a few more cloves, added some ginger, a medium onion, and some cayenne pepper. It turned out moist, tender and delicious! Wow, I never thought I could make something like this at home. THANK YOU, CHEF JOHN!!! Wishing you and Michelle a wonderful 2012 ahead! I was planning on doing this on the grill using indirect heat but it decided to rain in summer, stupid Texas weather. Had it with Chef John mashed potatoes and mushroom gravy. Tried this out, and my whole family enjoyed it!!! =) Thank you so much for the fun and informative videos! I learnt/am learning so much about food and how ingredients work best from these recipes! cheers! I have tried many of your recipes and love their simplicity and great results. I cook a lot and am always looking for tips & techniques to help improve my cooking. I have learned a lot from you. Thanks. I do have a question on this recipe, why did you choose to add the salt right before baking rather than add it to the marinate? Wouldn't the saltiness penetrate the chicken better if it was in the marinate? Would removing the skin alter the recipe too much, do you think? I've been a silent follower for a long time and I've made this recipe a few times and love it. Being a single guy, I've had to cut the ingredients in half because it makes more than I need. The other night I had 2 lbs of really nice boneless, skinless chicken breast and as I was going to use this recipe, I thought I'd be creative and add my personal touch. Here's the list of ingredients that I used. I cut up the chicken breast into large pieces and scored them so they would absorb the marinade and baked them the same as in the original recipe. The brown sugar and miso paste really kick it up. Thanks for a recipe I'll use for a long time. Why no instructions? Oven temp., how long to marinate, etc.???? Also, a link to print would be nice. CJ: I know you posted this years ago and frankly after coming across this on Youtube looking for a different treatment for wings it took a bit of effort to find the original post on your website. So perhaps leaving a comment at this point is rather moot. However I will anyway. I made six pounds of wings using this marinade and took them to a gathering last weekend. Since I was doing a quick marinade I left it on the counter and the aroma of garlic was intoxicating for those three hours (oh yeah.) My daughter and I were soooo looking forward to these. I got one piece, and only because I nibbled on one as I set that big bowl-o-wings down on the table. My daughter and her friends got none. Zip, zero. I couldn't even find the bowl until it came out of the dishwasher later in the evening. I am making this again, four pounds of wings worth, tonight. And the only diners are me, my daughter, and her friends. 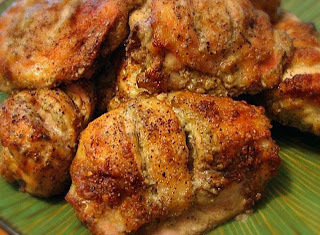 Folks, this is a garlic chicken marinade recipe to die for! I am a retired American guy living in Poland with my Polish wife. She still works. Tonight, I made this chicken from your video and recipe. It turned out wonderful. It even looked like what you took out of the oven. My wife loves garlic and she was thrilled with the meal. Thank you for your videos and recipes. You are always informative, helpful and entertaining.